This book is the first to synthesise this exciting new area for undergraduates. Taking a topic-based approach, it emphasises the social contexts of development and the developmental aspects of social reasoning and social behaviour. Kevin Durkin is professor of psychology at the university of western Australia. His research and teaching interests include child language development, children and the media, gender roles, and adolescent problem behaviour. 2. Social Life and Infancy. 5. The Development of Gender. 6. Language Development I: Origins and Course. 7. Language Development II: Social Dimensions of Acquisition and Use. 8. The Development of Non-verbal Communication. 9. Social Cognition I: Understanding the Social World. 10. Social Cognition II: Social Reasoning and Societal Knowledge. 11. Social Cognition III: Social Interaction and Cognitive Development. 12. The Development of Aggression. 13. The Development of Prosocial Behaviour. 16. Adolescence II: Entering the Adult World. 18. Adulthood I: Development, Relationships and Roles. 19. Adulthood II: Middle Age and the Later Years. * The first new survey of an important field for many years. 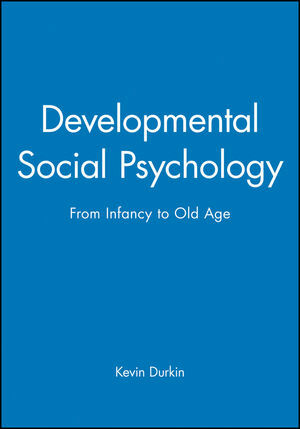 * Synthesises developmental and social psychology. * Illustrated with many examples from a variety of cultures.